Audiophile enthusiast starts for the first time cascading multiple MUTEC MC-3+ Smart Clocks to enhance the acoustical result of digital audio re-clocking even more. It is already widely known that the re-clocking function of MUTEC's MC-3+ Smart Clock enhances the quality of digital audio signals dramatically and thus improves most of the currently available DACs clearly audible. But one of the moderators of Germany's Aktives Hoeren Forum didn't want to stop at this point and started for the first time to raise the audio improvement by re-clocking to a new level through cascading multiple MC-3+ Smart Clocks. Read what he found out. A re-clocker ensures that the DAC finds best possible working conditions in terms of the quality of the supplied S/P-DIF signal. The less jitter the in the S/P-DIF format integrated clock signal contains, the less jitter results from the DA conversion. This has a significant impact on certain sonic parameters and in turn on the music enjoyment. Thus, it is also clear that if you already get a clean digital signal from a source, a re-clocker is more or less useless. In my estimation this is however hardly the case. Based on my experience where a further re-clocker (in this case it was the Apogee Big Ben) slotted in ahead of the MUTEC MC-3+ re-clocker gave a further increase of sound quality, I went on to consider how far you can push this. I spoke with Mr. Peters of MUTEC GmbH about my experiences and we agreed that it would be an experiment worth to try out. A few days later three more clocks were with me so I could cascade four devices of the type MC-3+ with my own clock. This means that the S-P/DIF signal of my audio PC is fed to the first clock. Its re-clocked output signal is then fed into the next MUTEC Clock from where the re-clocked signal is exported to the next MUTEC Clock etc. until the re-clocked S-P/DIF signal of the last clock finally enters the DAC. I marked the devices with numbers 1- 4, stacked them on each other to investigate any sonic effect by changing the connection sequence, which according to my ears did not occur. All devices were connected to the same phase with their own power strips. Digitally the devices were both linked with each other and by using Apogee WydeEye, they were on the input side connected with the audio PC and on the output side with the DAC. The length of the cords varied between one meter and five meters. To check any tonal differences that could be based on different lengths, I also changed the cables among each other during the listening tests. Anticipating the result, it showed no sonic differences. To get a broader spectrum for a sound comparison, I added to the Fireface two more good converters, in terms of the D/A conversion each basing on its own design: the NAD M51 and the T+A DAC8. Just a short glimpse at the different constructions: The NAD M51 works up to the analog output jacks purely digital. Via a so-called DDFA chip (Direct Digital Feedback Amplifier) from Zetex, the M51 receives its PCM data, converts them into a PWM bit stream (according to the manufacturer 7 bit/844kHz) which then is amplified by switching transistors and finally is treated with a flat low-pass filter. The T+A DAC8 however works more conventionally - but with a certain effort: its own multi-level re-clocking unit directs the processed signal to each of two DA chips (Burr Brown 1795) per channel, with four digital filters and one analog filter selectable, two power supplies for digital and analog applications, between the analog and digital section a complete galvanic isolation via opto couplers, no OPAs but a discrete design of the analog output stage. Background for the choice of exactly these two devices was my interest to what extent different transducer concepts would react on the upstream re-clocking. Anticipating the result again, both concepts benefit from it equally. I took the test songs from the genres classical/baroque and jazz - all through familiar musical pieces to me. As there is an "analog silence" in the sound, you can hear louder without the effect of a quicker fatigue. The bass range sounds cleaner, more contoured and with more pressure, at the same time it has more depth. In the upper mid and treble range the sound is more precise and vital, a lot more open and absolutely stress-free. Associated with it, sibilants in voice renditions sound at the same time smooth and precise, without lisping, hissing, or any sharpness. The overall sound is more vivid, sparkling like a glass of champagne. The virtual stage is wider and deeper, creating more spaciousness around individual instruments/voices. In complex passages, it is easier to keep track acoustically as it sounds less cluttered. More happens in the middle between the speakers. Instruments located far left or right move a little bit into the middle position. Above all, the reverberation "blows" from the respective corner more articulated over the middle to the other side, giving a clearer and more consistent room impression. The sound "stands" more solid and clearer in the room (a more focused localization). The speakers step more into the background. The sound appears to be more detached from them. When I speak of sonic enhancement or attenuation, I refer to these phenomena. Since my curiosity was very high, I instantly got in with the 4-cascade. Already with the first musical piece, I noticed how quickly the 4-cascade synchronizes - without any cracking or crackling. After a quick flashing, running off in succession in all four clocks (less than half a second per clock) the first few bars could be heard. It is a recurrent and well-known phenomenon that one cannot imagine how an improved setup would sound like until you actually hear it: the first measures revealed a clear, quiet and yet lively sound, fanned out into spatial nuances that I had not heard before in my room. The first few minutes with this sound are a bit like getting hooked. For the following hours, my inclination on any benchmark tests vanished - now only listening and immersing into the music came first. As they say, it is so beautiful to rediscover your music collection. Not to end my report at this point, hours later I began to remove one re-clocking device after the other, to listen every time to the same pieces in comparison. With only three units left, the difference could be heard, but the music was still enjoyable. With two devices, I found the difference already uncomfortable, with only one stage unacceptable and the bare DAC as a source sounded to me like I would rather stop listening to music. Amazing how quickly you can get used to it. Moreover, just as almost everyone with our hobby knows, such a habit can become quite expensive. When I sat down again after a long listening break, hearing with only one re-clocking stage again seemed to sound quite good - but it remains a feeling of being less involved in the music, compared to hearing with two or three or even four levels, the previous impression had in a way burned into my mind. In the further process, I tried to find out the impact of the differences between the individual re-clocking stages in relation to the respective DACs. The RME Fireface UC, in comparison to the other two DACs, offers a soft detailed sound picture where finer details are sort of "sanded" round. The tonal character tends to slightly metallic, while the spatial imaging compared to the other two DACs turns to appear rather flat with less depth. The NAD M51, in comparison to the Fireface, shows a much more detailed sound contrast. It sounds livelier, more hands-on and dynamic, sometimes slightly tending to aggressive treble. The bass sounds stronger, more structured and in the fundamental range according to my opinion slightly overstated ("Stereoplay" attested it that "somewhat peculiar tonality"). The stage is wider and has more depth gradation than the Fireface. The T+A DAC8 does a good job according to my ears: it is dynamically gripping and sparkling lively, without ever running the risk of being aggressive. Its treble is silky, yet more open and detailed than the NAD M51. The bass is very controlled and tight but offers at the same time a pleasing warm sound. In the spatial sound reproduction, it is a bit airier than the NAD M51. Its stage is more diversified and has a bit more depth graduation. Overall, it is the most analog sounding DAC of the three candidates. (For the DAC8 experts: the digital filter "Bezier 2" and the analog filter for the extended frequency range up to 50kHz "Wide" were enabled). By re-clocking, the Fireface loses some of the sharpness while keeping its slightly metallic sound. The NAD still sounds crisp. Its treble range that usually tends towards a certain aggressiveness now sounds pleasantly silky. The slightly over-emphasized fundamental range remains but it flattens. With the T+A DAC8 however the bass sounds a little slimmer but with more depth. Overall, with an increasing number of stages the re-clocking has a pleasant corrective influence that lets the respective DAC sound more harmonious. All three candidates have in common that their spatial rendition (i.e. the width of the stage, the separation of individual instruments and the more focused localization) increases considerably with every re-clocking stage, creating an increasing orderliness. You dive more into a musical event, you are more wrapped up and involved in the musical event. 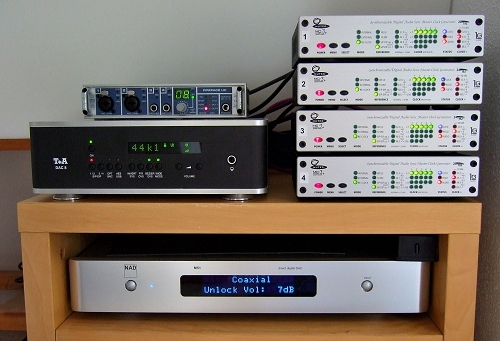 By a similar amount, a slight increase of the detail rendition is central to all three DACs. While the advance of the NAD M51 and T+A DAC8 against the Fireface UC remains, the Fireface UC benefits the most of it. Yet the impression remains that a thin pane of frosted glass lies over the musical event that lets the details appear slightly sanded round. But this impression is mitigated a bit by the other re-clocking stages. 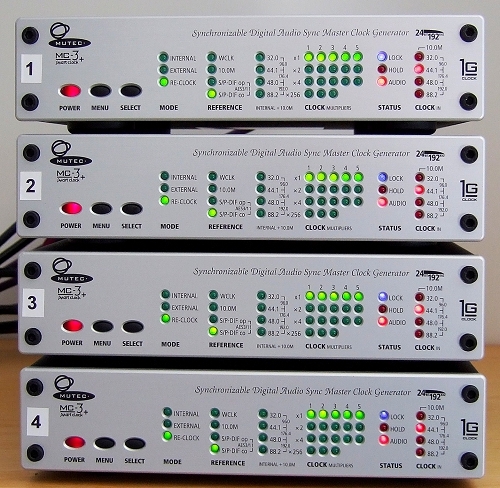 Nevertheless, even after four re-clocking stages, the Fireface is far from where one of the other two DACs is without any re-clocking. With these parameters in which the two DACs NAD M51 and the T+A DAC8 also have an edge over the Fireface, the alteration by re-clocking is not that much noticeable. Even after four stages, only an insignificant increase of these parameters is audible in all three DACs. Certain sonic peculiarities are completely or almost completely retained through all re-clocking stages. Unequivocally, the DAC can be heard through all the stages, too - so to say a sound signature of its own. This of course has to do with the fact that the converter chip with its subsequent electronics has the last word on the tonal character and not the re-clocker(s). That this effect has not only to do with the analog output stage, I could verify by connecting all of my DACs to my amplifier (see V-thread) and then to the active monitors (the gap still remained significantly above even if the Fireface benefitted the most from this measure). An essential part of the DACs sound signature seems to be due to the conversion unit itself (including the converter chip) and on this a re-clocker naturally has no influence. It reminds me a bit of my experience with the Rosita streamers: no matter which model you take, they have all the same sound character, so that one can speak of a sound family (similar sound families are known e.g. with the speakers of MEG Geithain). The difference between the cheaper models and the flagship is merely that more "analog silence" comes into the sound. More details are audible and the spatial imaging increases - as if an additional re-clocking stage was interposed. Other parameters such as the spatial imaging, the tonal balance, and the detail rendition literally start blooming with every re-clocking stage. Regarding these parameters, there is no alternative in my view to a re-clocker (or a re-clocker cascade). I do not know how much money you would spend on a DAC to get such a sonic result in terms of these parameters. Especially when the stages are switched back, in all DACS a growing restlessness, a nervousness in the sound and a real shrinking of the spatial stage become obvious. Everything seems increasingly lifeless, undefined, and exhausting to listen to. The brain has to work harder to find orientation in the sound. To give an approximate (!) clue to what scale I experienced each sound increase, a table is added below. Please note: even if values ? ?and numbers are used here to make things somewhat describable, they still are but subjective impressions. Others may come to quite different assessments. How different the degree of sonic improvement can be subjectively perceived, previous reports have shown clearly here in the thread. My personal result in "Cumulative Sonic Increase" is that two more clocks added to the first clock double the achievable sound improvement. According to my ears, a fourth clock only offers a bit of sound improvement that still is perceptible without any effort. Thus, this inevitably pushes on a cost -benefit analysis. As in all other device categories, the old principle that the cost for a result that has to be achieved with the progress of optimization, does not increase linearly but exponentially, is valid in the digital world, too. At some point, everyone reaches his personal limit where he is no longer willing to invest the required amount for a further sonic enhancement. One MUTEC clock costs about 700 € (street price), two clocks are 1.400 €, three clocks 2.100 €, and four clocks 2.800 €. Thus, the question how many re-clocking stages would pay off to achieve a sound improvement can only be answered individually (and depending on the rest of the chain). Let me go through my personal example: the team NAD M51 plus two MUTEC clocks is about 3.500 €. The achievable overall sound performance is in my opinion far superior to what one can achieve with a single DAC for 3500 €. My personal conclusion from the cascade experiment is that I now use three MUTEC clocks in my setup - and I will get myself a better DAC in the near future. Even with the Fireface UC, I since experience a previously unknown music enjoyment I no longer want to do without. Re-clocking already leads after listening to only some musical pieces to a strong dependence with unpleasant withdrawal symptoms when stopping the re-clocking - especially at doses > one clock. More information about the MC-3+ Smart Clock can be found here.